The model contest in Indy was held last Saturday. I will have a full report posted soon. However, I wanted to post a photo of what I bought at Indy. As you can see I have added several kits to the stash. I already had one Italeri SM-79 but I picked this one up real cheap and I couldn’t pass it up. All the other kits were fairly pricey, but they are all hard to find items that I have been looking for. Does this go too far? I know that the law in KY is the same as in this CT case. Ok, if you are a lawyer and a fan of the show South Park, you have to watch the video below. It was prepared by Harvard law students for their upcoming annual comedy spoof. What goes around, comes around. I am not crying about this. A recent business trip to Maryland resulted in an opportunity to eat at the Phillips Crab House location at BWI airport. I’ve eaten there once before and I can say, as far as airport restaurants go, it is better than most. The prices are high, but then again, you combine seafood and an airport location, and I don’t think you can expect anything else. I had the crabcake. It was good. Plenty of crab meat, and not an excess of filler. My only real complaint is that the crab cake was a little bland. I sprinkled on a little of their house version of Old Bay to give it a little more flavor. I had their microbrew beer which was good, though a little to hoppy for my taste. One of my dining companions had their Ahi Tuna and assured me that it was good. All in all, a good dining experience, made better by the fact that I didn’t have to pay for it. I try not to do politics on this blog. There are other places for that. However, this may be the dumbest idea I have ever heard? How could a sitting attorney general even think such a thing was a good idea? I fear for my country. There are the makings of a good lawyer joke here. I just haven’t worked out the details yet. I don’t know why, but I find this blog entertaining. Just a silly way to pass a few minutes. I am happy this guy is no longer practicing law. A modeler in the making. A week or so ago, my nephew, Chris built a pinewood derby car for Boy Scouts. Here he is using my airbooth and airbrush. The car is Tamiya Lemon Yellow. Chris was pretty good with the airbrush. A modeler in the making. 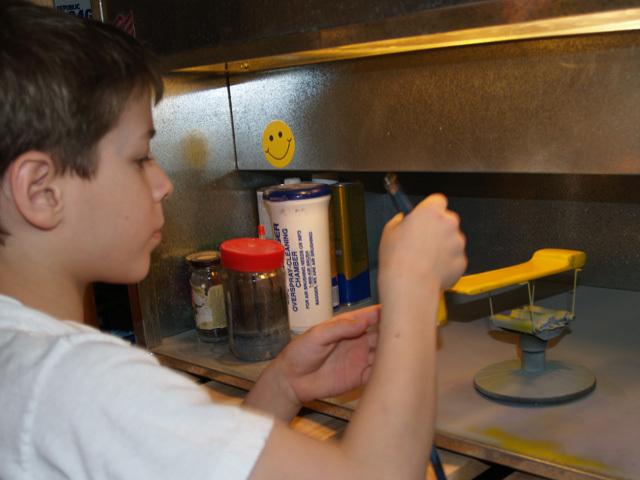 Chris painting his pinewood derby car.